NOW® Relora® is a safe, non-sedating formula that can help to alleviate symptoms associated with stress such as nervous tension, irritability, concentration difficulties and occasional sleeplessness. 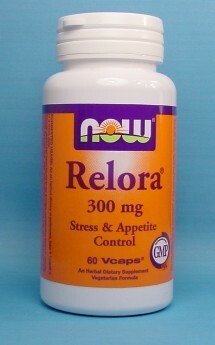 The relaxing effect of Relora® can thereby help to control appetite and prevent stress-related eating, aiding in weight control. It can also help to reduce or control stress hormones. In a clinical study conducted at the Living Longer Clinic in Cincinnati, 50 people suffering from chronic stress were administered 200 mg of Relora® three times daily for two weeks. Results showed that 8 out of 10 participants felt more relaxed and 7 out of 10 reported more restful sleep. Post trial analysis revealed 78% of the patients felt more relaxed, and while the product does not cause significant sedation 74% of the patients also experienced a restful night?s sleep. Only 24% of participants reported drowsiness. In addition, Relora® was judged to be gentle on the stomach by 94% of the subjects, and no significant side effects were reported. Most people today have a high stress level. This can cause chronically high levels of cortisol, the so-called ?stress hormone?. High cortisol is known to cause various problems, including weight gain around the waist. Excess cortisol can be detected through saliva hormone testing. (See our Hormone Tests section.) If high cortisol levels persist, they can cause a state of acidosis (acid constitution) in the body. Researchers believe that acidosis opens the door to a host of degenerative diseases. It certainly can cause bone loss, since the body will buffer the pH of the blood even at the cost of taking calcium from the bones, if necessary. Relora® has been shown to support normal, healthy levels of cortisol and DHEA (which generally means lower cortisol and higher DHEA for those who are stressed). A second trial conducted at the Living Longer Clinic measured cortisol and DHEA levels in patients with mild to moderate general stress. A two-week regimen of Relora® caused a 227% increase in salivary DHEA and a 37% decrease in salivary cortisol levels, as amounts of each of these substances returned to normal in all subjects during the course of Relora® use. Take 1 Vcap, 2-3 times a day.